Increased supplementation may help prevent osteoporosis. Most nutrition professionals are aware that calcium supplementation is recommended for the prevention of osteoporosis if people can't obtain adequate amounts through food alone, but can magnesium supplements provide additional benefits? A recent study by Frost & Sullivan, funded through a Council for Responsible Nutrition Foundation grant, found that women aged 55 and older who take 100 mg of magnesium supplements per day could reduce their risk of osteoporosis and potentially save $6.8 billion in hospital utilization costs.1 Despite these findings, experts question whether magnesium supplements actually provide protection against osteoporosis. The National Osteoporosis Foundation recommends daily calcium intake of 1,000 mg for men aged 50 to 70 and 1,200 mg for women aged 51 and older and men aged 71 and older, including supplementation if necessary.2 The National Osteoporosis Foundation also recommends 800 to 1,000 IU per day of vitamin D, which helps bones absorb calcium, for individuals aged 50 and older, including supplementation, if needed.2 Some health care professionals believe magnesium, which converts vitamin D from an inactive to an active form, hasn't been properly recognized for its role in bone and overall health and isn't consumed sufficiently by the majority of the public, while others say most people get enough magnesium in their diets and don't have to worry about increasing intake. "The big question is, if you're a normal person with a healthful diet and don't have conditions that predispose you to magnesium deficiency, would adding magnesium actually have an impact on your bones?" asks Pauline Camacho, MD, FACE, the director of the Loyola University Osteoporosis & Metabolic Bone Disease Center in Chicago. "Interestingly, there's actually no data that it increases bone density or decreases fracture risk in regular people who have fairly healthful diets. So there's no data in this kind of healthy population that indicates they would need extra magnesium." Camacho recommends magnesium supplementation only for people who are prone to magnesium deficiency. She says low magnesium levels are attributable to underlying medical conditions, such as chronic liver disease and certain bowel diseases. For a healthy person with a healthy gut, she considers supplementation optional. On the other hand, Carolyn Dean, MD, ND, author of The Magnesium Miracle, and a medical advisory board member for the Nutritional Magnesium Association, says magnesium's benefits often are underestimated and poorly understood. She says hundreds of enzyme systems require magnesium, and standard serum magnesium tests don't provide a true gauge of magnesium levels in the body. Dean recommends a magnesium red blood cell test to adequately assess magnesium levels. "Medicine hasn't regarded magnesium as having any beneficial properties because [clinicians] just do a serum magnesium test. Only 1% of the total body magnesium is in the bloodstream so, if you just check that, you're not getting any indication of what's going on in the cells," Dean says. "The serum magnesium will always try to stay in a normal range to help keep the heart functioning. If the serum magnesium goes down, the body's biofeedback mechanisms draw magnesium from the bones, where 60% of the magnesium resides, or from the muscles, to support the heart." There's some evidence that calcium supplementation, with or without vitamin D, slightly raises a woman's risk of cardiovascular events, especially myocardial infarction.3 This doesn't mean people who take calcium supplements are necessarily getting too much calcium, Dean adds, but they may not be getting enough magnesium. Camacho thinks the calcium concerns are overstated. For normally functioning people, she says calcium doesn't build up in the body; although certain medical conditions do cause excess calcium to build up in some people, those conditions are rare. Calcium supplementation alone, she says, shouldn't cause adverse effects, if taken within the recommended doses and if there are no preexisting conditions, such as high blood or urine calcium. "If you take too much calcium, your body recognizes it, and you'll start excreting it in your urine. Absorption, naturally, is also somewhat decreased so there are ways that our body compensates for excessive intake," Camacho says. "It's very, very difficult to induce a state of hypercalcemia from calcium supplementation, meaning to the point that you measure the blood and the calcium is high. That's an extremely large dose of calcium." The main side effect from excess calcium supplementation, Camacho says, is constipation. She says she sometimes prescribes magnesium for patients who experience this symptom because magnesium can produce a laxative effect. In fact, the laxative effect is the main side effect of excess magnesium intake, Dean says. Research about cardiovascular events stemming from calcium supplements has shown conflicting results. The Daily Reference Intake (DRI) value for magnesium is 350 mg for men over age 30 and 265 mg for nonpregnant, nonlactating women over age 30.4 According to the "What We Eat in America" report, one-half of all people in the United States don't get enough magnesium and, in some demographic groups, two-thirds of people have inadequate intake.5 Foods that contain magnesium include almonds and cashews; beans; bran cereal; dark cocoa (without sugar); dark green, leafy vegetables, such as spinach; halibut; pumpkin seeds, which have one of the highest concentrations; seaweed; soybeans; Swiss chard; and tofu. The type of diet a person eats also may affect how much magnesium he or she needs. For example, the typical Western diet, which tends to be low in vegetables and legumes, is less likely to meet magnesium requirements. 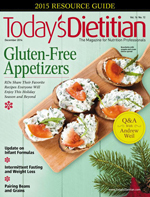 Toby Smithson, MS, RDN, LDN, CDE, a spokesperson for the Academy of Nutrition and Dietetics, says getting magnesium through diet alone isn't especially difficult, however, if people eat the right foods. "It's fairly easy to get the recommended dietary allowance for someone who follows a Mediterranean, DASH diet, vegetarian diet, or consumes a variety of foods. If your client is a meat and pasta eater, they may run short on magnesium," Smithson says. "The best sources of magnesium are found in legumes, nuts, whole grains, and green leafy vegetables. Green leafy vegetables contain chlorophyll, which contains magnesium. Halibut and soy are the two protein foods that are highest in magnesium." Smithson adds there's some interesting research emerging about the roles of potassium and magnesium in maintaining bone health and slowing bone loss. She says fruits and vegetables generally contain plenty of these nutrients. One difficulty in getting magnesium from diet alone, though, is that magnesium content can vary widely, depending on how the food is grown. If food is grown in nutrient-depleted soil, magnesium levels may be low in many crops, Dean says. Liz Weinandy, MPH, RD, LD, an outpatient dietitian at The Ohio State University's Wexner Medical Center, agrees that getting adequate magnesium from diet alone can be challenging for some people who don't eat enough vegetables, legumes, and nuts. In addition, she says magnesium doesn't get enough attention for the role it plays not only in bone health but in overall health. She suggests people take a daily multivitamin that includes magnesium. "For too many years, we've just been throwing calcium at people. Now, we're on top of the vitamin D piece, but I think magnesium is still that one missing piece," Weinandy says. "I think even getting the recommended daily amount, for most people, would be a fabulous start because hardly anybody is getting that amount." Ultimately, whether magnesium supplementation is desirable or necessary for most people remains an open question, but supplementation within the DRI guidelines doesn't seem to carry a significant risk for healthy individuals. 1. Smart prevention — health care cost savings resulting from the targeted use of dietary supplements. Council for Responsible Nutrition website. http://www.crnusa.org/CRNfoundation/HCCS/chapters/CRN-HCCS-brochure0913.pdf. 2. Cosman F, de Beur SJ, LeBoff MS, et al. Clinician's guide to prevention and treatment of osteoporosis. Osteoporosis Int. 2014;25(10):2359-2381. 3. Bolland MJ, Grey A, Avenell A, Gamble GD, Reid IR. Calcium supplements with or without vitamin D and risk of cardiovascular events: reanalysis of the Women's Health Initiative limited access dataset and meta-analysis. BMJ. 2011;342:d2040. 5. United States Department of Agriculture, Agricultural Research Service. What We Eat in America, NHANES 2005-2006: usual nutrient intakes from food and water compared to 1997 dietary reference intakes for vitamin D, calcium, phosphorus, and magnesium. http://www.ars.usda.gov/SP2UserFiles/Place/80400530/pdf/0506/usual_nutrient_intake_vitD_ca_phos_mg_2005-06.pdf. Published July 2009. • Spencer H, Fuller H, Norris C, Williams D. Effect of magnesium on the intestinal absorption of calcium in man. J Am Coll Nutr. 1994;13(5):485-492. • Stafford RS, Dreiling RL, Hersh AL. National trends in osteoporosis visits and osteoporosis treatment, 1988-2003. Arch Intern Med. 2004;164(14):1525-1530.